Our company commits to maintaining the highest standards of quality and safety in operations. Employee health and safety and environmental protection are the highest priorities of SMNM-VECO and an integral part of our company’s business. We recognize protection of personnel lives and health and environmental protection as imperative values, while our employees bear the responsibility for complying with the requirements of regulations, rules, standards and guidelines related to Health, Safety (Industrial Safety) and Environment. We continuously improve HSE Management System to mitigate any risks and hazards and upgrade personnel qualification through various trainings on safe work practices. 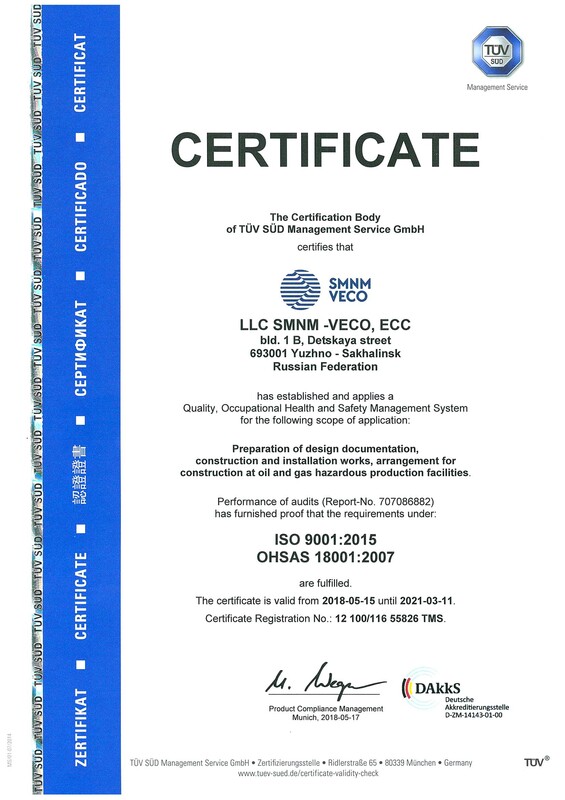 SMNM‐VECO has all required certificates and licenses to perform construction and installation works at hazardous industrial facilities and assets, and a certificate of TÜV SÜD AG German Corporation that confirms compliance of quality management system, industrial safety management system and HSE management system with international standards ISO 9001:2015 and OHSAS 18001:2007. Moreover, SMNM-VECO has a license for major construction works No. 0129.04-2012-6506007900-С-019 issued by Sakhalin Self-Regulating Union of Constructors. All company’s personnel are certified in accordance with requirements of industrial safety, NAKS, ASME, visual and measuring control in order to perform works at Sakhalin oil and gas fields and offshore assets.